The placement of the woman in the kitchen was a popular theme, and the setting for this narrative work, with the construct of the woman framed by the doorway, is very much in keeping with the style chosen by Alice Bale in her work 'Interior (Morning Papers)', c.1913. 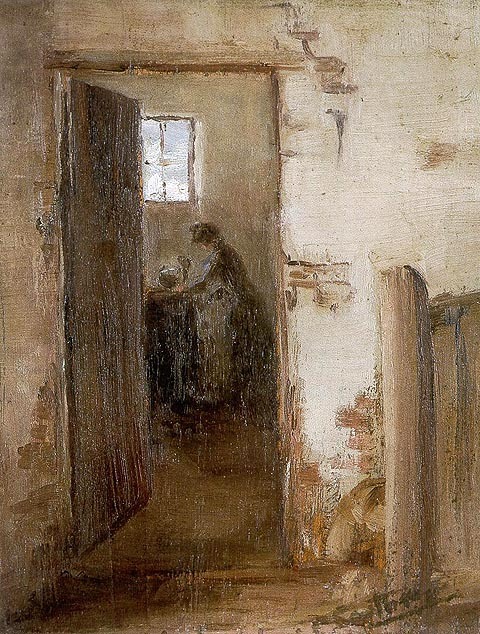 Also at this time, Frederick McCubbin was producing a number of 'kitchen' works. Some depicted his wife, Annie, in her kitchen at 'Fontainebleau' on Mount Macedon, such as his work 'Shelling Peas', 1912, and others depicted his daughters in the same kitchen, such as the depiction of his daughter, Sheila in his work 'The Recipe', 1914. At this stage of her life, Clara Southern was living in Warrandyte, and 'The Kitchen' is likely to have been painted locally in the Warrandyte area. The work had at one time been in the collection of John Thornton Tweddle, the husband of Clara's close friend, Isabel Hunter Tweddle. J.T.Tweddle also owned Clara Southern's work 'A Cool Corner', which he donated to the Ballarat Fine Art Gallery in 1937. The work was offered for sale through Christie's Australia. Australian and European Paintings, Drawings, Prints and Ceramics. April 1995, Catalogue no.51.